Welcome to Episode #33 of the Living Homegrown Podcast! As soon as Thanksgiving is over I start to panic a little bit when I think about the upcoming holiday season. If you’re like me you probably prefer to give DIY gifts whenever possible. There’s something special and personal about giving something that you created yourself. 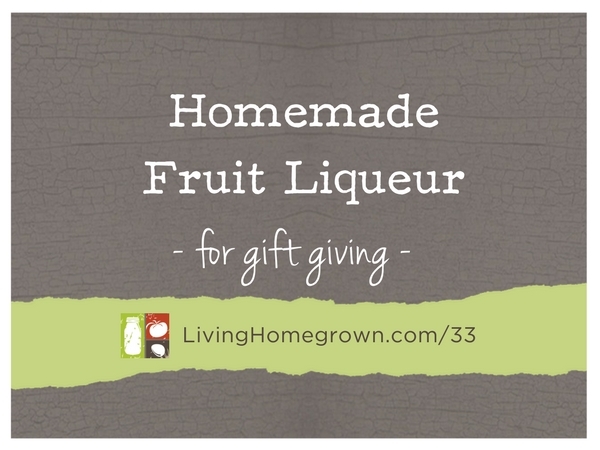 So in today’s episode I’m chatting about how to make fruit liqueur – (the accelerated way). Homemade liqueur normally takes several weeks to create. But since we are short on time before the holidays hit, I share tips for making liqueur QUICKLY. The result is still delicious and is sure to delight your friends and family. Limoncello Martini – video demonstrating limoncello liqueur in a martini. I use the same method but substitute any fruit liqueur for the lemoncello. I always use the same base spirit in the martini that I used in the liqueur (vodka or gin). Love your podcast, such amazingly helpful and inspiring information! Just a quick question, can you, instead of creating a sugar syrup, just add sugar directly into the strained vodka and let it dissolve for a couple of weeks/months, or does it have to be dissolved in water before going in? Thanks! Yes, you could add sugar directly but the sugar usually tends to settle at the bottom. It may dissolve, but does not stay evenly distributed. (Just shake a bottle a bit before pouring) Also remember – if you do that, there is no water added to help cut the alcohol so it will be a higher alcohol content and a bit harsher taste. That’s fine too – It all depends how you want to use it later. Ah, yes, I did not think of the fact that it would cut the harshness of the alcohol. Thanks so much for the feedback! !